The U.S. EPA has published renewable identification number (RIN) generation data for May. More than 34.23 million D5 advanced biofuel, 211.93 million D4 biomass-based diesel and 1.16 billion D6 renewable fuel RINs were generated in May. The weakening of the Brazilian real versus the U.S. dollar affects the attractiveness of ethanol in relation to sugar, lowering the level of the world sugar price to a point at which millers begin favoring ethanol over sugar production. Woodland Biofuels received word on June 26 that it will receive up to $800,000 in funding from in Federal Economic Development funding from the Canadian Government. The money will be used to optimize its demonstration plant in Sarnia, Ontario. Abengoa has inaugurated its demonstration plant that uses Waste-to-Biofuels (W2B) technology. The plant has a capacity to treat 25,000 tons of municipal solid waste (MSW) from which it will obtain up to 1.5 million liters of bioethanol. The U.S. Supreme Court has decided not take up the petroleum industry's E15 appeal, which was filed by the American Petroleum Institute, Grocery Manufacturers Association and a consortium of other organizations in February. On June 25, President Obama laid out his three-part plan to address climate change during a speech at Georgetown University in Washington, D.C. "As a president, as a father, and as an American, I am here to say we need to act," he said. The U.S. House of Representatives Energy and Power Subcommittee held a hearing June 26 on the renewable fuel standard (RFS), titled "Overview of the Renewable Fuel Standard: Government Perspectives." It featured testimony from government officials. The Global Renewable Fuels Alliance has reacted to a Food and Agriculture Organization report by noting that while many improvements have been made since the first draft, the report still contains several methodological and factual errors. With summer driving season here, a new public opinion poll gauges the consumer impacts of constantly fluctuating gas prices and reveals what Americans think is the solution: renewable fuel. The survey was commissioned by Fuels America. Six blender fuel pumps are featured at a new gas station in Velva, N.D. The Farmer's Union Oil Co. convenience store was financed with more than $3 million in loans and grants, including a grant of $159,000 from the Rural America for Energy Program. 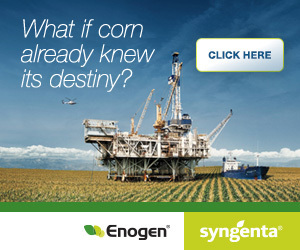 Officials at Iowa Speedway have announced that Syngenta and its Enogen brand seed corn will be the presenting sponsor for the NASCAR Camping World Truck Series race at the Newton track on July 13. Responding to the fourth in a series of five white papers from the Energy and Commerce Committee of the U.S. House of Representatives, two trade associations pointed to the renewable fuel standard (RFS) as a successful energy policy that is working. President Obama is expected to speak about his plan to fight climate change during a speech at Georgetown University on June 25. Those in the biofuels industry are hopefully the plan will recognize the benefits of renewable transportation fuels.